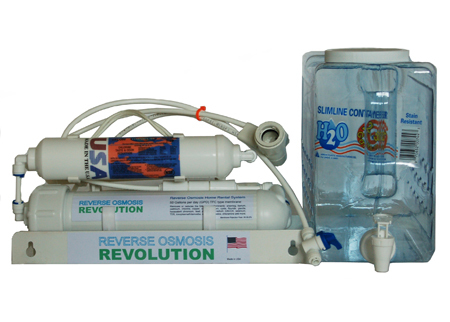 1) The number one reason to choose a Reverse Osmosis Revolution system is the huge savings in time and money for you. For a family of three, the average savings of our system over store bought bottled water is up to $1500-1600. These are the actual costs our customers pay. That is not including the time and gas spent traveling to and from the store, all to purchase what you can now produce in your own home. Your family will have access to unlimited clean, fresh water for sports activities, gym workouts, traveling, and cooking. A single individual drinks a gallon of water each day on average. That can total over $1500 per year for a family of three. The costs are even higher for larger families. With a Reverse Osmosis Revolution system, you can cut your costs and save hours of time, all while drinking clean, healthy water right from your own faucet. 2) Our filtration system is the same one used by 40%-60% of the top name water brands in their huge plants. Many of the big name companies are under no restrictions for where or how they bottle their water. That means your water could come from a location next to a dump site or in the middle of an industrial park. Don't let the fancy labels fool you. You can get the same or better quality of water, all from your own home, in unlimited quantities, all for less than the top brands. 3) Installing a Reverse Osmosis Revolution system means no more heavy bottles to lug around or damage to the environment from hundreds of single use plastic bottles clogging the landfills. Now you can choose safe water bottles from your home and fill them with as much clean, pure water as you need. Filtered water is at your fingertips, as little or as much as you need, without having to purchase, store and dispose of heavy containers or individual bottles. 4) At the home of Reverse Osmosis Revolution, we think of every customer as a friend. We want to help you live a healthy life with pure, clean drinking water at your fingertips. Each of our customers is an important part of our business and we want to work with you to find a solution to your water problems in a way that fits your lifestyle and your budget. We pride ourselves on our professionalism and a personal connection to each of our customers. Here is an estimated cost breakdown for purchasing an RO system. Total cost : $410 to $700 and you own a three year old system which will require more replacement parts and filter changes. The costs keep piling on the longer you own the system. That figure may sound amazing, but it is a close approximation for a family of three. If each member of the family consumes the average of 1 gallon a day and the average price of bottled water is $1.85 per gallon, you can see how quickly the costs add up. This figure does not take into consideration the cost to the environment of all those plastic bottles or your time, gas and expenses in traveling back and forth to the store. Our price for 4 or 5 Stages Countertop RO system: $89.99.. $119.99. Start saving today!